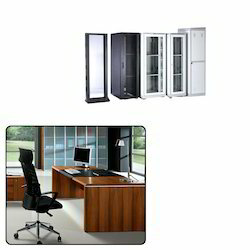 We offer Server Racks as well as Sheet Cabinets and Sheet Metal Parts. We are an esteemed organization involved in manufacturing and supplying a range of Server Racks. These racks is used for various requirements of telecom, banks, cable wire and allied sectors where it used for holding servers. These are manufactured from quality basic material which is procured from reliable sources. Front glass door with lock and key is provided. Ventilation, back door operable with lock and key also is an option. Standard 19 inch fixing rail with frame. Our range can also be customized according to the need of our valuable clients. We provide a wide range of Server Racks for Corporate Use which help in segregating various servers by increasing their storage capacity. These are manufactured from quality basic material which is procured from reliable sources. This is available with rugged frame construction, which offers high stability as well as load bearing capability.